How to register the program to get full version? 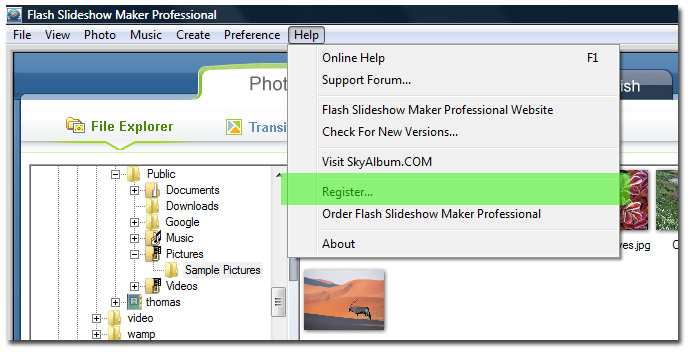 Flash Slideshow Maker Professional is delivered via downloading. After your purchasing, you should have received a registration name and code in your email inbox instantly. In a few cases, you should wait for several minutes to hours for credit card verifying. 1. Run Flash Slideshow Maker Professional. 2. Click the "Help" menu of the software and click the "Regsiter..." menu item. 3. A registration dialog will popup, please enter your registration name and code in this dialog. Please enter the name and code EXACTLY as it appears in your email. You can copy and paste instead of typing manually.